The transcriptome assembler Trinity, like many other bioinformatics command-line tools, sends its principle output (a transcriptome assembly) to a named output file. It writes other information about the status of the run to standard output. I recently helped a colleague use Trinity to generate a primate transcriptome assembly, and when we ran the program we did two runs, one with standard logging and one with the verbose output turned on. In both cases we used file redirection to send the output to a file. So what did we end up with? If you run Trinity without redirecting the output to a file, you will just see the percentage completion number overwrite itself on a single line of output. This doesn't work so well though if someone does choose to redirect the output to a file. You could also make an argument that no-one really needs to see such a high level of precision when reporting the state-of-completion of each step (four decimal places!). 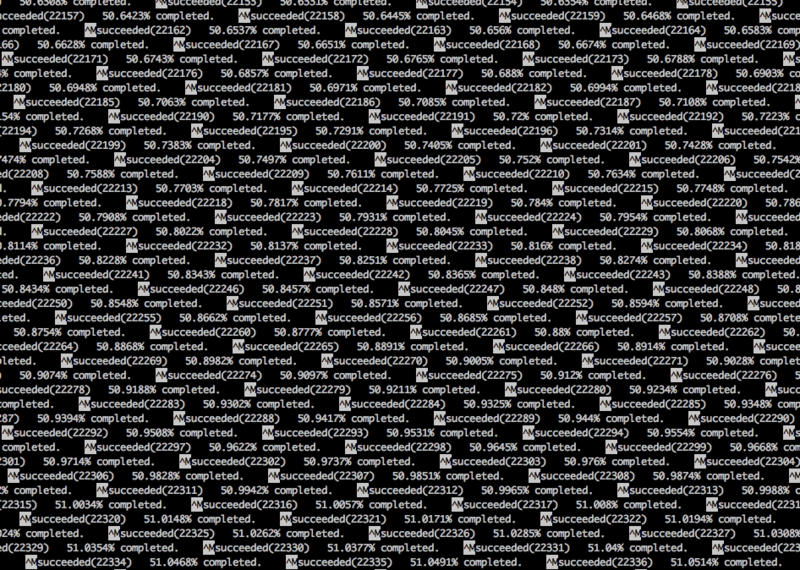 I think this is an example where the verbose log file ends up being so big as to be largely unusable. If you wanted to search for a specific string in that file, then maybe it would be helpful. The main problem is that the Trinity developers are trying to be smart by having the program overwrite output — regarding the percentage completion status of each step — on various lines of output. However, this is only useful if the user chooses not to redirect the output to a file (something which is incredibly common in bioinformatics). I would argue that for 99% of cases, it is more than sufficient for a program to indicate 10–20 lines of output regarding the state of completion, e.g.